Take a structure designed to protect tender plants from frost, and turn it into something that keeps cattle cool in high summer? 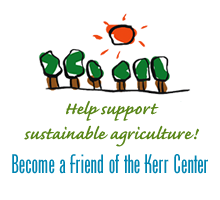 Sure – it’s just another example of the Kerr Center livestock program’s can-do approach to innovation. 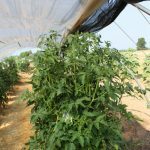 Many people have seen, built, and used Tod Hanley’s hoop house design to keep frosts off tender crops. Perhaps not so many have realized it also works for shading crops in hot weather. The livestock crew took that thought a step or three further, starting with the fact that animals as well as plants can benefit from a little extra summer shade. As easy as the Hanley-style hoophouse is to put up and take down, though, doing so every day or two to keep up with a rotationally grazing cattle herd would be impractical at best. On top of that, it was never designed to stand up to cattle rubbing and pushing and scratching on it all day long. The livestock team found a single solution to both problems. They welded up a pipe frame that holds the feet of every hoop, and has rigid runners down both sides connecting them and serving as skids. It’s stout enough to stand up to cattle’s daily activity, but still light enough to drag from pasture to pasture. The hoophouse frame isn’t a one-size-fits-all solution. 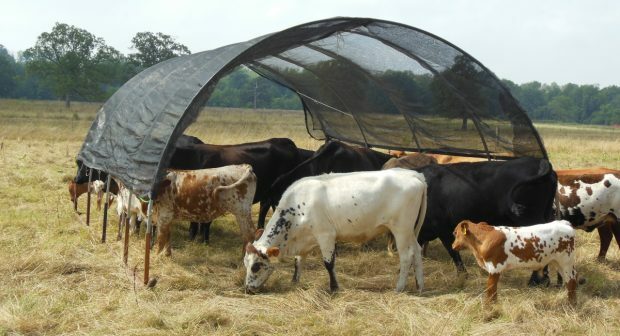 It doesn’t offer shade for many cattle at a time, and it can’t go everywhere on the ranch. However, it goes up faster than trees, making it an excellent temporary stand-in in pastures with limited natural shade, or in high-use paddocks near barns and handling pens. It’s even been pressed into service to keep human beings out of the sun from time to time – at outdoor summer workshops, for instance.